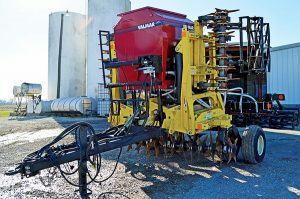 The Salford Valmar 55 Series line of seeders is ideal for seeding cover crops and overseeding pastures. From seeding to herbicide application, these units can quickly and precisely meter granular products of any size. The 55 Series seeder is also highly adaptable, able to work with tillage implements, heavy harrows, high-clearance sprayers, and AerWay® models of any size. With the Salford Valmar 55 Series line of seeders, granular application is easier, safer, and more accurate than ever before.